Send tips to blog@cwa-union.org or @CWANews. 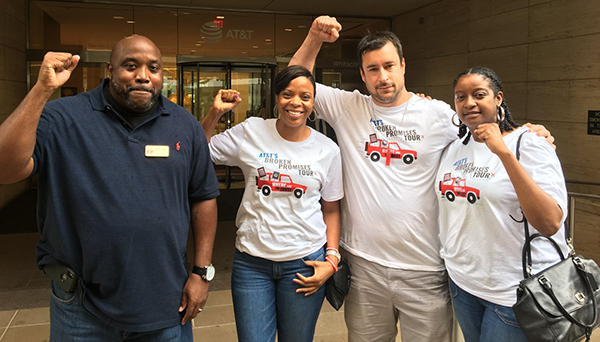 CWA members delivered more than 100,000 petition signatures to AT&T Headquarters in Dallas last Friday during the final stop of the AT&T Broken Promises Tour. The tour kicked off in Detroit on August 6 and participants attended rallies and roundtable meetings in Toledo and Columbus, Ohio; Indianapolis and Bloomington, Ind. ; Kansas City, Mo. and other cities in the region that have experienced the effects of AT&T's job cuts. Check out the highlights video here. Elected officials continue to pressure AT&T to live up to the promises the company made on creating jobs with its massive profits from the Republican corporate tax cut bill. All 30 members of the Indiana House Democratic Caucus, led by Indiana House Democratic Leader Dr. Terry Goodin, sent a letter this week to AT&T Indiana President Bill Soards calling on the company to settle a fair contract with workers that protects and creates jobs as was promised by AT&T during debate over the tax bill. Similar letters have been sent by all of the Democratic members of the Ohio State Senate led by Ohio State Senate minority leader Kenny Yuko, and by Ohio House Democrats led by House Minority Leader Fred Strahorn. AT&T CEO Randall Stephenson pledged that if the tax cut passed, the company would spend at least $1 billion in capital expenditures and be able to create "7,000 good jobs for the middle class." Instead, despite $20 billion in tax savings, a new CWA analysis based on AT&T's Q2 earnings report estimates that the company has eliminated over 7,000 jobs since January 2018 when the tax cuts took effect. "It is our understanding that just weeks after the tax bill passed, AT&T laid off 1,500 workers. We also were advised that just this past week, another surplus was announced," the letter states. "We stand with the workers of Indiana and we support CWA's demand of job security, healthcare, and the return of contracted out/offshored jobs," the Indiana representatives wrote. CWA members at Verizon in the Northeast and Mid-Atlantic regions and at Verizon Connected Solutions voted to ratify a four-year extension of their current contracts, which were set to expire in August 2019. The extensions provide for additional wage increases and enhanced retirement benefits. The agreement, which extends the contracts through August 5, 2023, will deliver an 11.2% wage increase over the additional four years and covers more than 34,000 Verizon workers, including call center workers, and central office and field technicians. "This agreement builds on the success of the 2016 strike, and it will ensure a better future and good, family-supporting jobs for thousands of Verizon workers," said CWA District 1 Vice President Dennis Trainor. "This is a solid contract for Verizon workers that will improve wages and raise the living standards of our members across the region," said Ed Mooney, Vice President for CWA District 2-13. Separate agreements were ratified covering 40 Verizon Wireless retail workers in Brooklyn and 7 workers in Hazleton, Pa., who voted last month to join CWA. Members of CWA Local 1400 and IBEW System Council T-9 voted overwhelmingly to ratify the tentative agreements between the unions and Consolidated Communications covering 1,200 workers in New England. Both the CWA and IBEW agreements maintain affordable health care and local jobs for the life of the agreements, and provide enhanced retirement benefits through a new 401K savings plan. In addition, the agreements restore 128 days of seniority to members who held the line during the strike of 2014-15. 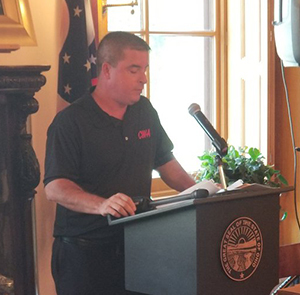 CWAers joined a group of community leaders at an event at the Ohio Statehouse to call on the Public Utilities Commission of Ohio (PUCO) to reject AT&T's request to drop out of the Lifeline program. 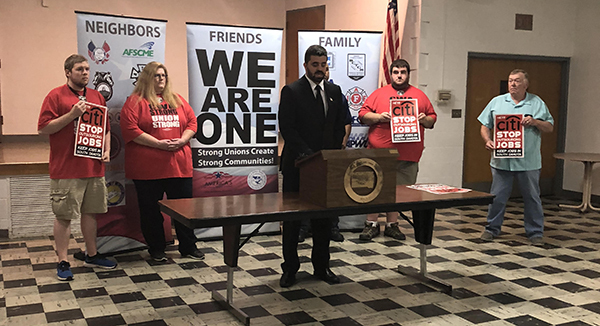 On Tuesday, CWAers joined a group including the NAACP, Ohio Poverty Law Center, Alliance for Retired Americans, and ProgressOhio at an event at the Ohio Statehouse to call on the Public Utilities Commission of Ohio (PUCO) to reject AT&T's request to drop out of the Lifeline program. AT&T's abandonment of the Lifeline program, which subsidizes vital phone and internet services, would harm more than 10,000 of their Ohio customers – including the elderly, veterans, and low-income households. "AT&T continues to put corporate profits over the needs of working families at every turn," said Ron Gay, Jr., CWA District 4 Staff Representative. "From their broken jobs promises following the tax windfall, to the call center closures and job cuts that have hit hard here in the Midwest, now this threat of withdrawal from Lifeline is just the latest attack. We aren't simply going to accept their behavior. We are organizing and will work to hold them accountable at every turn." AT&T withdrew from the Lifeline low-income discount program in 12 other states in 2017. In Ohio, there are a total of 1,597,000 households that qualify for the program, including 157,000 veterans and 452,000 households with children. Ohioans can submit comments via ProgressOhio here or on PUCO's website here. Earlier this year, Missouri Republicans passed legislation to weaken public sector unions by making most state workers at-will employees, forcing unions to hold recertification votes every three years, making unions get annual permission from workers to withhold dues from paychecks, and more. But members of CWA Local 6355-Missouri State Workers Union are fighting back, including ramping up their organizing with a week-long "blitz" in early August led by the local's officers and activists. Starting with a goal to sign up at least 40 new members, they ended up with 47, and signed up nine new CWA Political Action Fund (PAF) contributors. Members of the local have been organizing at nine state social services offices and youth facilities in the St. Louis area, asking both members and non-members alike to step up and join the fight to regain the public sector collective bargaining rights that were stripped away during the last Missouri legislative session. 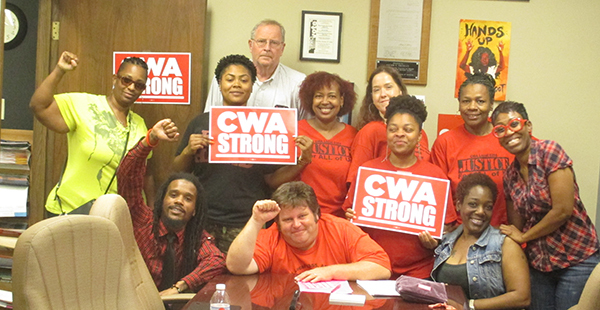 Those who are out to crush the public sector labor movement in Missouri have underestimated CWAers who are working to make CWA STRONG! CWA Local 6355-Missouri State Workers Union are fighting back against Missouri Republicans' attacks on public sector unions. 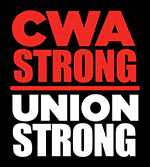 CWA members in South Dakota are leading the fight against the offshoring of call center jobs. Highlighting the recent local layoffs of at least 80 Citi call center employees in Sioux Falls this year alone, members of CWA Local 7500 held a rally in Sioux Falls this week to call for politicians to step in and act. At the event, CWAers and allies called on the South Dakota congressional delegation to stand up for local working families by backing the bipartisan "U.S. Call Center Worker and Consumer Protection Act." "Introduced in both the U.S. House and Senate, the call center bill would require that U.S. callers be told the location of the call center to which they are speaking," CWA Local 7500 President Kim Thompson said. The bill would also require that companies offer callers the opportunity to be connected to a U.S. based center if preferred and make U.S. companies that offshore their call center jobs from the U.S. ineligible for certain federal grants and taxpayer-funded loans. The event garnered attention from many local media outlets across the state. CWA members in South Dakota are leading the fight against the offshoring of call center jobs. Highlighting the recent local layoffs of Citi call center employees, members of CWA Local 7500 held a rally in Sioux Falls this week to call for politicians to step in and act. CWA members joined a Community Conversation event last week in the Bronx discussing how they can mobilize to make the community stronger. The event featured local CWA leaders along with congressional candidate Alexandria Ocasio-Cortez and progressive activist Ady Barkan. Sabrina Graves, a member of CWA Local 1180 and Vice Chair of the Bronx Borough Committee, talked about how union members can fight back in the wake of the Janus Supreme Court decision and unprecedented attacks on public sector workers, as well as how Local 1180 is organizing their communities with their borough committees. Sonji-Ann Roseborough from CWA Local 1106 and Elijah Zimmerman from CWA Local 1109 spoke about the importance of popular education and how CWA's Reversing Runaway Inequality workshop is teaching CWAers how the 1 percent has gained so much power and how racism is being used to divide the working class. Watch the full event here. 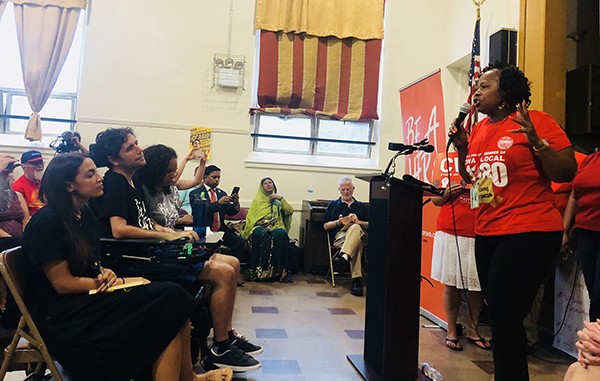 CWA members joined a Community Conversation event last week in the Bronx featuring local CWA leaders along with congressional candidate Alexandria Ocasio-Cortez and progressive activist Ady Barkan. Workers from General Dynamics Information Technology (GDIT), who are joining together to gain a voice in their workplace with CWA, were featured earlier this month at the Netroots Nation conference in New Orleans in a nationally livestreamed Worker Town Hall with Rep. Tim Ryan (D-Ohio). GDIT is the largest call center contractor with the federal government. With the help of CWA, GDIT workers filed a $100 million dollar wage theft complaint – the largest in history – against GDIT. "I'm now getting paid almost the same wages at GDIT to talk people through life-changing decisions, and to give them highly technical, complicated information about the healthcare they need," said Don Freeman, a customer service representative at the GDIT call center in Hattiesburg, Miss., who formerly worked at Walmart as a sales associate. "That just doesn't seem right. I'm tired of having to decide each week whether I'm going to buy food or put gas in my car." Cherie Terhark works at the GDIT call center in Bogalusa, La., helping people find the information they need about health insurance through the Affordable Care Act or Medicare. She said that her job was stressful and made harder by harassment from management. "We get a lot of pressure from management to keep taking calls, and when we try to take the time, or send our caller onto the advanced resolution center, we're reprimanded." "I've been organizing with my coworkers since I found out we were misclassified by GDIT and being underpaid." said James Finnemore, who also works as a customer service representative at the Hattiesburg call center. "In Mississippi, a state that isn't known for supporting unions, we are growing." Rep. Ryan noted the role that unions like CWA play in strengthening communities. "If you're a worker, unions are there, and I think they are one of the best paths for us to reclaim the middle class here in the United States." "I know that if we could be members of CWA, we could stand up to management and they wouldn't be able to get away with harassing and demeaning us," said Terhark. "They wouldn't be able to continue to misclassify us and pay us so little that we struggle to get by. That's why I'm working hard to make sure that we have a union." Watch the full town hall here. 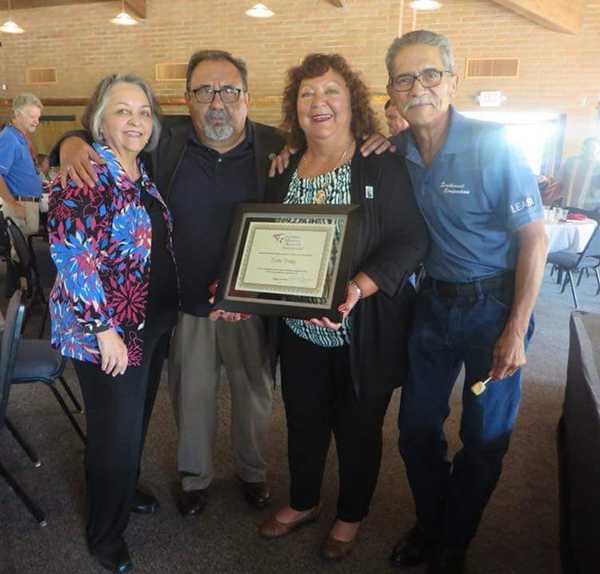 Cecilia Valdez, CWA 7026 Secretary-Treasurer, was honored with the 2018 Grijalva Champion of Social Security Award at a luncheon organized by the Arizona Alliance for Retired Americans. Valdez spoke about the importance of protecting and expanding Social Security as it faces threats from President Trump and the Republican Congress. Pictured, from left: Ramona Grijalva, Congressman Raul Grijalva, Cecilia Valdez, and Robert Valdez. The Boston Globe has launched an effort calling on news organizations to speak out about President Donald Trump's sustained assault on the free press. More than 350 news organizations have joined their call. "Journalists are on the front lines in a war on freedom of the press because President Trump has taken every opportunity possible to impugn our craft, our mission, our publications – us. But he has gone beyond simply calling us names and discrediting us. This union of journalists stands in solidarity with all who call out President Trump for his deplorable attempts to weaken a free press and the 1st amendment," the NewsGuild-CWA said in a statement.